A specifically designed fine compost for Sowing seeds into, or sticking cuttings in. Both require a fine grade of peat, with small particle sizes, to get best contact with the seed or cutting stem growing in them, as well as to hold enough water too, which is helped by the inclusion of a wetting agent. Contains vermiculite and fine wood fibre too. Supplied in 10L bag with a handy resealable easy-carry pouch. A specifically designed fine compost for Sowing seeds into, or sticking cuttings in. Use in see-trays or small pots. Both require a fine grade of peat, with small particle sizes, to get best contact with the seed or cutting stem growing in them, as well as to hold enough water too, which is helped by the inclusion of a wettig agent. Contains vermiculite and fine wood fibre too. Supplied in a handy resealable easy-carry pouch. 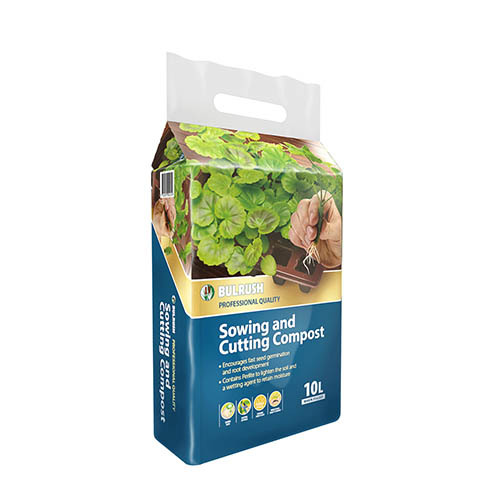 A 10L resealabale bag of Seed sowing and cutting comspot - very fine graned blend for maximum contact with seeds and stems, to give better results.